Garden Designer, Leonie Cornelius at work at the site. With art installations, inspired gardens and a focus on creating an inviting and integrated community space, the finish of W8 has been not just a brief, it’s been a labour of love for everyone involved. Garden designer, Leonie Cornelius and interior decorator, Grainne McGarty, joined the team last June and have been working to connect W8 with the local landscape. Leonie has planted “thousands of plants at this stage!” including native Birch trees, foxgloves and grasses, each reflecting the wildness of the surrounding hills and valleys. Edibles have also been included in planting near the entrance of the restaurant and there are plans to further expand on this idea for use by Ósta. In a nod to the Kerrigan family’s quarry business, Leonie has also used boulders as part of the structure of the raised beds and there is a real sense of connection with the landscape and the town. This connection is further emphasised by the textures, shapes and colours selected by interior designer, Grainne McGarty. “My brief was to connect with the local area and to also incorporate work by local artists,” said Grainne. But also striking is the amount of reclaimed and repurposed materials she has brought into the design. Each element has clearly been carefully selected to sit within the space and to give a sense of flow. Jackie McKenna, overseeing the installation of one of her commissioned artworks at W8. 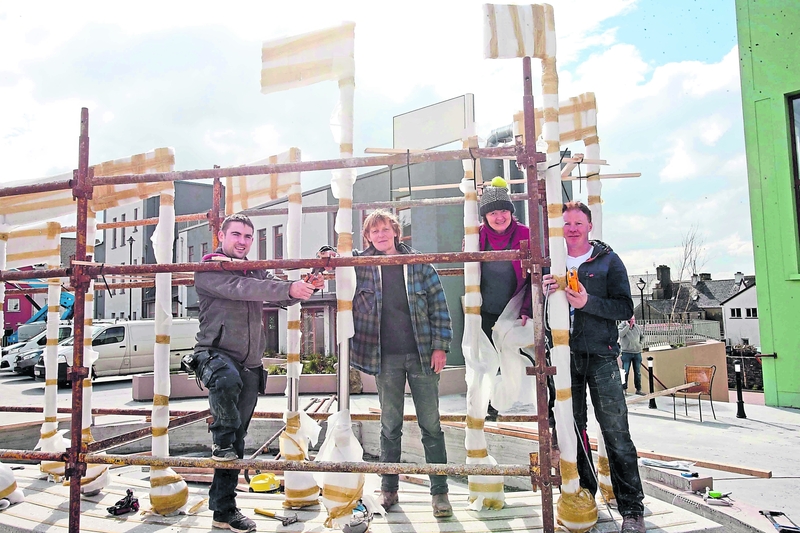 Acclaimed sculptor, Jackie McKenna, has been commissioned to create two art installations for the communal areas. In the lower courtyard area, just outside Ósta is her tribute to the five glens of Leitrim. Made of granite and incorporating water smoothed pebbles “a tribute to our small piece of coastline” she explains - it has been designed to encourage people to sit, relax and interact with the artwork. The upper courtyard is home to “a more playful piece” inspired by the music of the area. “They are both labours of love,” Jackie says. Artwork features prominently here. Paintings, prints and photographs from local artists are also given pride of place in the accommodation and a striking mural also takes up the gable wall on one of the buildings. It is the work of Marian Noone aka FRIZ, a Sligo born artist who works in both traditional and digital mediums. The construction phase for W8 has already been a massive jobs boost for the wider North Leitrim area with nearly 50 jobs created during the construction work at the campus. Now Ósta restaurant is set to bring an additional 15 jobs to Manorhamilton with the potential for a further 15 jobs to be created down the line. Bríd Torrades, Ósta Café and Restaurant, has already established a successful business in Sligo and she is excited at the prospect of opening the doors on her Manorhamilton premises over Easter. “We are already taking bookings and have bookings for Easter. I am really looking forward to opening the door,” she said.